Publicity Stills of "The Dark Knight"
The follow-up to the action hit “Batman Begins,” “The Dark Knight” reunites director Christopher Nolan and star Christian Bale, who reprises the role of Batman/Bruce Wayne. In “The Dark Knight,” Batman raises the stakes in his war on crime. 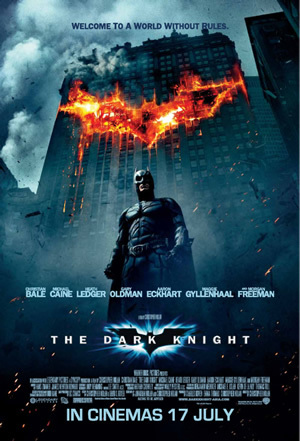 With the help of Lieutenant Jim Gordon and District Attorney Harvey Dent, Batman sets out to dismantle the remaining criminal organizations that plague the city streets. The partnership proves to be effective, but they soon find themselves prey to a reign of chaos unleashed by a rising criminal mastermind known to the terrified citizens of Gotham as the Joker. Where does one start when one has to review what is possibly the most colossal theatrical release of 2008? This is the one movie that is bound to cause the box office to go into frenzy and the one movie that has been on everyone’s must watch list the moment its predecessor ended. 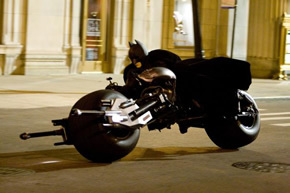 So, does The Dark Knight live up to the vast amount of expectation placed on it? Every damn bit. No introductions to characters really needed, the movie starts off more or less where it left off. And from the beginning, you will come to realize that this movie is not exactly Bruce Wayne/Batman’s story but The Joker’s as it is Harvey Dent’s but I will get to that later. The Joker enters and leaves an immediate mark, a warning of things that will come to Gotham City. Harvey Dent, the newly appointed District Attorney sets out to put the crime rate at an all-time low and The Joker rallies every villain in Gotham City to fight back and points the blame to the Batman. What ensues is a near two-and-a-half hour rollercoaster ride. All the talk about a posthumous Oscar for the late Heath Ledger is well, pretty much credible now. Heath Ledger completely loses himself in the role of The Joker. He is diabolical and menacing, the stuff, only nightmares are made of. Whatever the Joker says, plans and does are frightening and the consequences are unimaginable. This is truly the essence of a man without a care in the world for others. This role is Ledger’s and is in a different league from what Jack Nicholson has done with the same character many years ago. The acting fraternity has really lost a true actor who was never afraid to lose himself in such a role. And The Joker really complements Batman as THE villain just as Venom was THE villain to Spiderman. They, as nicely put, “complete” each other. The Joker throws everything in his arsenal at Batman and every time Batman thinks he has solved The Joker’s puzzle, he throws out yet another ace up his sleeve. He may be wild but he is pretty meticulous. People die, things get blown up and every little thing that should rattle Batman to his core. Their relationship is much better fleshed out unlike the rushed and frazzled attempt with Venom and Spidey in Spiderman 3. Aaron Eckhart is the other revelation in this movie though it is no surprise that he might be overlooked for Ledger. He has been taking up fairly interesting roles of late with Thank You For Smoking being a highlight movie. But here in The Dark Knight, his Two-Face is far scarier than Tommy Lee Jones’. “You either die a hero, or you live long enough to see yourself become the villain.” Dent could not have said it any truer. His story is akin to that of a Grecian tragedy with his quick rise to the top being a White Knight to the city and his swift descent, becoming the bitter and vicious Two-Face. Most importantly, his acting is tops when he is conflicted at being the fall guy when he has been the upright one all along. All the talk of The Joker and Harvey Dent does not mean Batman plays a secondary role to all this. Instead, Batman is constantly forced to think of ways to be ahead of his rivals and face his moral conscience. The struggles he has to face in this movie will crumple the normal man and you will have to wait till the very end to see how he deals with everything. Christian Bale like his other co-stars, personifies the role he assumes and you never doubt him. He had done a great job with Batman Begins and he continues to do the same as does Michael Caine as his butler, Alfred (who gets the funniest lines) and Gary Oldman playing the noble, Commissioner Jim Gordon, who himself is forced into a stifling situation. Maggie Gyllenhaal replacing Katie Holmes as Rachel Dawes fares better than her predecessor and even has a scene which is bound to wrench your heart. Gotham City is far from a fictional setting or a backdrop, we see more of it in this movie and it feels like a real city that we know of or have lived in. There is not much to fault really when the look and feel of the city is genuine, the character buildup and development is sublime and the love for the material is all around. This is the thinking man’s superhero movie and it really hits things out of the ball park. As for awards and accolades, there will be many come the season. 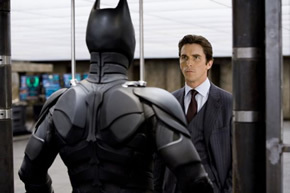 The Dark Knight is a movie where the struggle between good and evil reveals its truest colours. Loud action and explosion sequences are kept to a where necessary and gritty real time situations are the salvo. The usual superhero affiliated gags are far and few keeping laughs to a minimum and forces you think and develop an insatiable appetite for more. This is an example of profound storytelling at its best. I have not mentioned the director and co-writer, Christopher Nolan at all through the course of this review because he is what encapsulates the review. This is one man who uses his keen eye, beautiful mind and open heart to make his films. And what a glorious result that has translated to the silver screen.